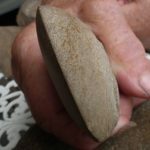 The community Stone Artifacts Day held recently (30.6.12) at the Euroa Arboretum, was an outstanding success. Despite the cold, rainy weather, everyone that booked came, and then some more. In developing the idea for the day, we’d felt 20 to 30 people would be a good turnout. With a few less, we could have a nice, intimate campfire session, hear some local stories and collect a bit more information about indigenous artifacts, from local people. To our amazement, about 70 people turned up on the day – from far and wide and all walks of like. It was a terrific gathering and starting off with a big bonfire and the BBQ cook-up was a brilliant and delicious way to get into the mood. Once the workshop got underway there was plenty of interest shown in the large variety of stone artifacts brought forward. In all, eleven collections were brought along by landholders and shared with the workshop. Significantly, most of these were ‘new’ and hadn’t previously been formally recorded. All eleven landholders were happy for the Taungurung Clans Aboriginal Corporation (TCAC) to follow up and formally document these collections. It may well be that these collections contribute to a better understanding of how Aboriginal people occupied and managed their land, before the European invasion. A big THANK YOU goes to the TCAC for helping to make this day such a success. We all appreciated hearing the stories and perspective brought to the day by the various members of the Taungurung mob, particularly Rodney & Shane Monk who, during the workshop and before hand, have helped to make this an exciting and worthwhile project. And local archaeologists Jo Bell and Francisco Almeida helped us all understand what we were looking at, as well as field numerous questions – thanks to both of you. The Strathbogie Ranges Conservation Management Network hopes to continue this exciting collaboration with the TCAC.